There is a great deal of singing and dancing that goes on at The Little Man's home. One of his favorite songs is "Frozen Heart" from the popular "Frozen". 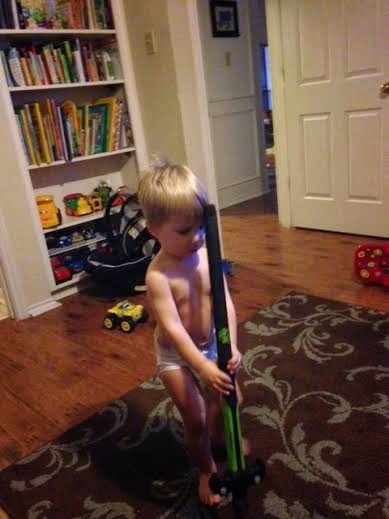 He takes his sword and acts out the motions and sings the lyrics--it is pretty darn cute. A good life lesson for us all. Why would a heart be icy--frozen? As I thought this over, it is not from heartbreak. This creates a bruised and torn heart---but there is no ice. A broken heart may cause a protective barrier to be erected around the heart in an effort to prevent further injury---but the heart still feels--it is not icy or frozen. A frozen heart---is perhaps created when we are unwilling to forgive---hold a grudge--have deep seeded anger which simmers deep within us. I learned a LONG time ago--my anger only hurt me AND gave power over me to the one it was directed toward. Even righteous anger can become a wall between us and God--if we allow it to become an idol in our lives. Why would I allow anything to stand between God and me? What would be so important that I would give it the power to become more important than my relationship with Him? When anger and resentment rule our lives---they become idols of our hearts. SO---as the title song says---"LET IT GO!". I for one am not able to let it go with my own power or because I say I will---I have to hand my inability to forgive--my anger over to God--and allow Him to help me give it up. There is a need to tell Him I cannot do this on my own---ONLY with your help. THEN the thaw begins and my heart once again loves in warmth. do no harden you hearts. mmmm ... good to see you writing again, friend! trust me, your presence is missed here and there! Hi Lulu! Like Linda said, it's nice to see you back again! Greetings Lulu. Hope you're keeping well.